Dr. James W. Porter is the Josiah Meigs Professor Emeritus of Ecology and Marine Sciences at the University of Georgia. He specializes in the ecology of coral reefs. Dr. Porter has testified before Congress five times, most recently on the impact of global warming on coral reefs. 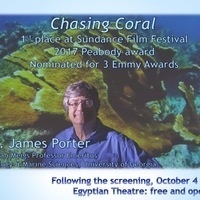 His film, Chasing Coral, on the effects of global warming on coral reefs world-wide, won first place at the2017 Sundance Film Festival, a 2017 Peabody Award, and has been nominated this year for three Emmy Awards.